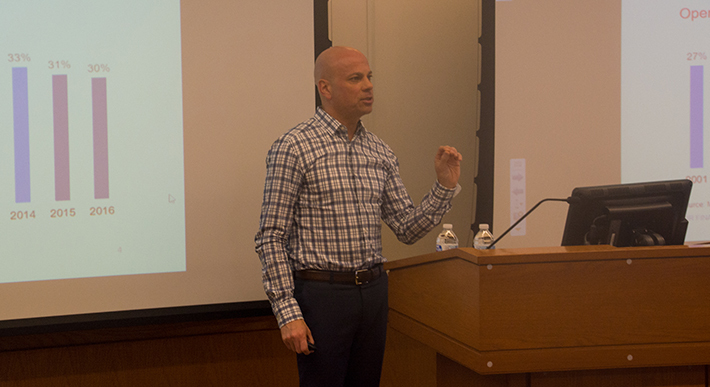 Tom Rampulla, a Drexel LeBow MBA graduate and a managing director at Vanguard, returned to his alma mater to deliver an Industry Brief to students in the Executive Doctorate in Business Administration (DBA) program. Vanguard, one of the world’s largest investment management companies and one of the Philadelphia area’s most widely-known companies, is LeBow’s Corporate Partner of the Month for April. Rampulla was introduced by George Tsetsekos, dean emeritus and Francis Professor of Finance. Rampulla noted that Tsetsekos was a mentor to him during his MBA studies, but when they met up a few years later, the professor said, “I don’t remember you.” This “very humbling experience” drew laughs from the audience and Tsetsekos himself. Now a 30-year employee with Vanguard, Rampulla can recall when the company was “a walk-in branch and a phone with two dozen products – and that was it.” He went on to become, in his words, “employee number one in Europe” as he worked to bring Vanguard’s services into the European market from his location in London. He now heads up management of the company’s relationships with financial advisors, the professionals who make investment recommendations. The company had never previously worked with financial advisors, and Rampulla returned from Europe to head up that initiative in 2002. Throughout the presentation, Rampulla, Tsetsekos and the DBA students struck up a lively and interactive conversation, with perspectives balanced between professional observations from working experience in related industries and consumer perception of the company and the wealth management industry as a whole. He gave an overview of the industry and Vanguard’s position within it, emphasizing that Vanguard works differently from many of its competitors: “we’re owned by the investors in our funds.” While Vanguard’s success as a company and increased market share within the industry are definite points of pride, Rampulla also outlined the challenges to continued growth that Vanguard and its peers in asset management face, including social and political ones—mentioning investments in firearms companies in particular—and challenges with attracting talent. That last point, reflecting the coming brain-drain with the anticipated retirement of senior leadership, struck a chord with the DBA students, who work across a range of industries. Drexel University’s LeBow College of Business will be providing a customized MBA program to selected employees at Vanguard, one of the world’s largest and most respected mutual fund companies. Morgan Merge now works for the Peace Corp as a community economic development advisor in Benin, a country in West Africa.